the kalla boo (aka the KA) and i used to nuke baby potatoes as snacks, when we were impatient 14-year-olds. 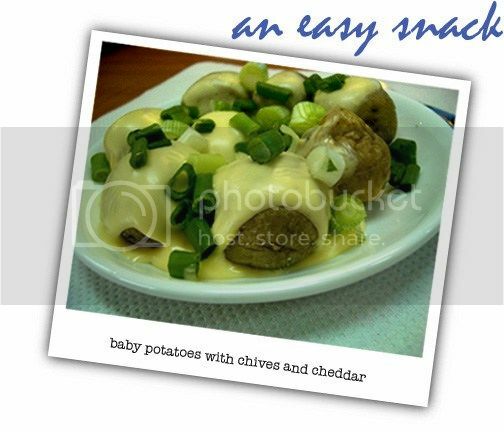 i'd forgotten about this super-easy, duper-yummy snack for many years now... until i saw a bag of baby potatoes in marketplace @ raffles city, while buying up a storm of comfort foods the other day. i couldn't resist grabbing some. 1. wash potatoes well (potato skin has heaps of good stuff and should be consumed... it's yummy too). 2. poke potatoes all around with a fork. 3. get cheese slices out from fridge and put on top of microwave. 4. nuke potatoes in microwave on high for 4 minutes 30 seconds. 5. drape softened cheese slices over potatoes. 6. nuke on low for 30 seconds. we seldom have sour cream lying around in the fridge, that's why. :) otherwise, sour cream tastes yums toos! for 4 minutes 30 seconds, i usually do a 6-8 potato portion! adjust if less or more! if you want crispier, can add another 20 seconds or so! Gah! Looks so good! Must make!